The major lesson that the U.S. national security apparatus took away from the Vietnam War was this: long wars fought overseas by armies of citizen-soldiers severely limit Washington’s freedom of action. Worse still, such wars invite the larger public to intrude into matters hitherto under elite control. From the perspective of those who manage national security establishment, this poses a terrible problem since the public is fickle and untrustworthy, and tempted by isolationism. In the 1970s, this problem had a name. It was called the Vietnam Syndrome—a pronounced reluctance to use force for fear of adverse consequences that might ensue. Members of the national security elite viewed the Vietnam Syndrome as a monstrous thing—a positive danger (not to mention a threat to the status and prerogatives to which they had become accustomed). Efforts to overturn the Vietnam Syndrome found expression in two important initiatives. The first was the creation of the All-Volunteer Force, which jettisoned the citizen-soldier tradition in favor of a professional military. Architects of the All-Volunteer Force argued that relying on professional soldiers instead of citizen soldiers would save money and produce a more effective fighting force. But doing so also promised to provide members of the policy elite greater latitude in employing that force. With a sufficiently capable army of professionals, the state could take the nation to war without involving the public. The second initiative related to the first. It sought to design the professional military as an instrument optimized to achieve rapid decision. Future wars, unlike Vietnam, would be short rather than long. More importantly, they would end in clear-cut victory. A mix of disciplined, skilled, highly-trained soldiers along with the best technology that money could buy would give U.S. forces a clear edge on any battlefield against any enemy. Ironically, this occurred just as the Cold War was ending. That is, the great national security threat that had produced the national security state in the first place went away. But the apparatus itself remained, as did those status and prerogatives derived from presiding over that apparatus. So Cold War or no Cold war, kicking the Vietnam syndrome kicked open the door to a new era of interventionism. The All-Volunteer Force became a busy force, sent off in the 1990s to Somalia, Haiti, Bosnia, and Kosovo and engaging in a form of ongoing quasi-war against Iraq and then Al Qaeda. Actual outcomes were mixed, but costs were relatively low. Happy to indulge the notion that the United States now reigned as the “world’s sole superpower,” the American public didn’t pay much attention. Where this new military activism was leading was the great unasked question of the Clinton era. The Vietnam syndrome was gone – that was for certain. What had replaced it? The events that followed 9/11 provided an answer: what replaced the Vietnam syndrome was something akin to permanent war, waged by a professional military that has proven to be remarkably durable but can’t win, directed by a strategically clueless elite, and indulged by a public that professes to “support the troops” but is largely indifferent to how they are used. That describes the story that has unfolded over the past fourteen years and continues today with no end in sight. 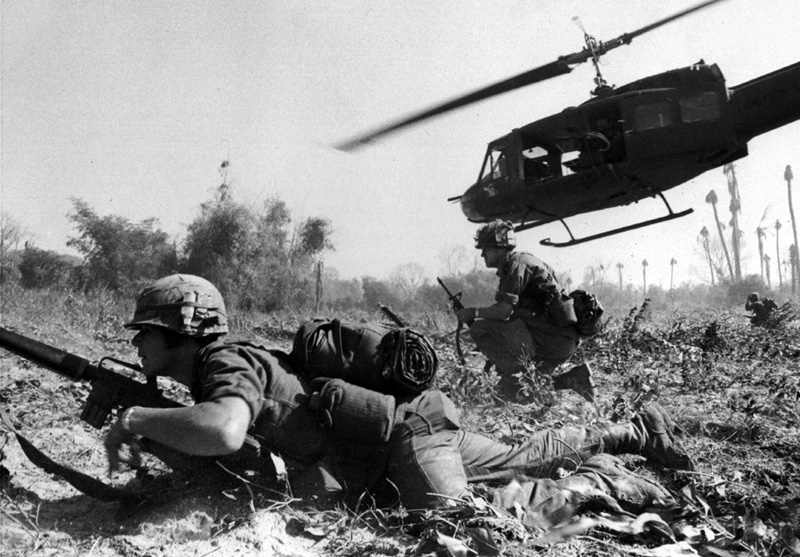 In retrospect, the really astonishing thing about Vietnam is how little it mattered to U.S. decision makers. In terms of appreciating the limits of American military power and the actual utility of force, we are in no better shape today than we were back in 1965 when President Lyndon Johnson so recklessly sent U.S. troops off to fight. Around the time that McNamara was leaving the Pentagon in 1968, that seemed like an absurd statement—Vietnam had most certainly raised the ire of many Americans who rose up to denounce what they called “McNamara’s War.” Fast forward to the present moment and the statement no longer appears absurd. Instead, it’s prescient. Ironically, as an indirect consequence of Vietnam, policymakers subsequently devised a set of arrangements that do enable the United States today to wage war without substantive public involvement. Nearly 50 years later, McNamara has gotten his wish, with results that in my judgment have been catastrophic. This is something well worth considering on the 40th anniversary of the Vietnam War’s conclusion. People may still debate the role of the antiwar movement in ending the war. What cannot be debated in the resilience and adaptability of the assumptions, institutions, and practices that produced the war in the first place. Within a remarkably short order, they waged a comeback to which opponents of war even today have yet to formulate an effective response. Andrew Bacevich is Professor Emeritus of History and international relations at Boston University. He was a commissioned officer in the U.S. Army and served as platoon leader in Vietnam in 1970-71. This article was originally published at Notre Dame University's Peace Policy Blog under Creative Commons License.